You’re probably up to your ears in summer season events and there just aren't enough hours in the day to do everything. Or maybe you're desperately trying to get all the grasses and wildflowers identified and catalogued in the conservation grazing meadow. Or perhaps the weeds have overtaken the garden in front of the visitor centre which could really do with a lick of paint come to think of it. So what can you do about it? Maybe add another volunteer or two to your willing cohort? 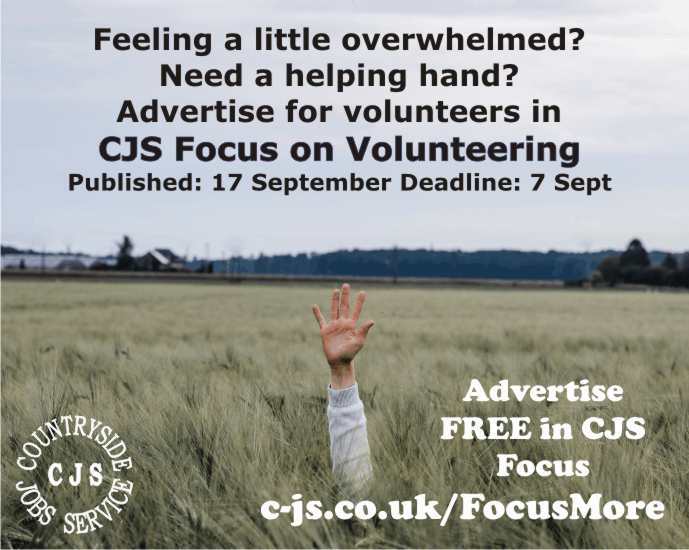 CJS Focus on Volunteering in association with TCV - The Conservation Volunteers will be published on 17 September but we're taking adverts now. This is your advance notice to draft your ad and send it to us. As usual free ads are available, up to 150 words for placements and posts and 50 words for more general project, recruitment day type notices. If you have a small budget available then make your advert stand out from the crowd by adding your logo for only £10. Long adverts for placements can be submitted here. Short adverts can be submitted here.